This year’s Lyrid meteor shower will happen on April 21-22. The first good news is this year it’s on a weekend. The second good news is the Moon will be at 1st Quarter phase, not bright enough to interfere with seeing the meteors, and it will set just after midnight. 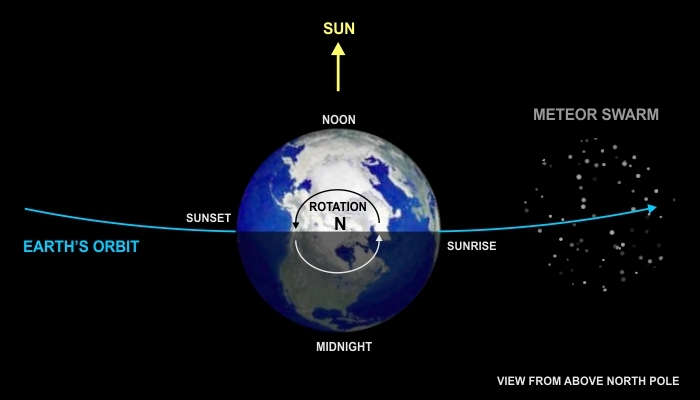 As with most meteor showers, activity increases from sunset to dawn, with the peak of activity visible just before the sky starts getting light. Observers can expect to see 10-20 meteors per hour (on average), but the Lyrids are known for surprising us with bursts of activity — in 1982 observers counted 100 per hour! Of course, all these numbers are based on observing under clear dark skies, so your mileage may vary. I usually wait for 2-3 hours after sunset before starting my observing. By then the sky is about as dark as it will get. Sunset on April 21 is around 19:00. 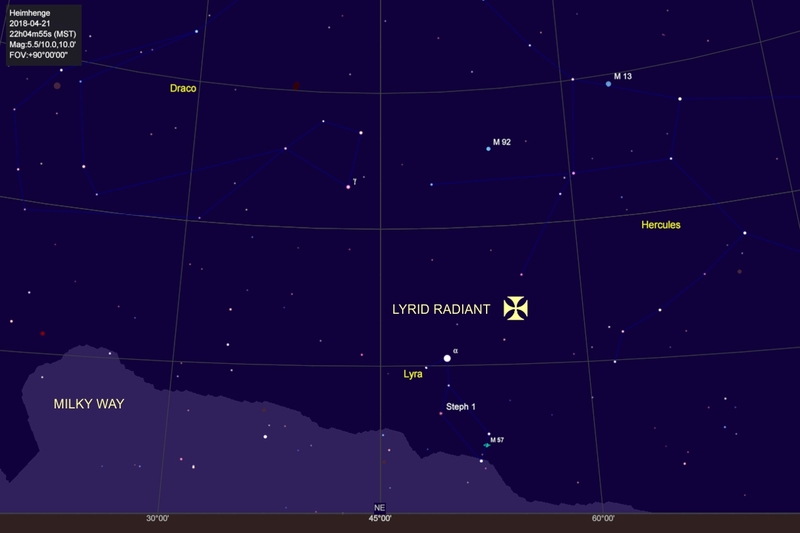 Ideally, you would observe the north-eastern sky from a location with an unobstructed view down to the horizon. The 1st Quarter Moon will be at your back, and will set just after midnight, so it won’t interfere with the fainter meteors. By 23:00 the Moon will be so low in the sky its light will be negligible. Good timing — midnight is when meteor activity normally starts to ramp up. The graphic below shows why. Two aspects of that graphic are NTS (not to scale). First, the curvature of Earth’s orbit is exaggerated. Second, meteor swarms are not necessarily that size or shape — they are generally elongated streams of debris many times the size of the Earth. The important idea is that Earth “runs into” the debris field, rather than it hitting Earth. The “radiant point” is simply the direction in space toward which Earth is moving. So in the pre-dawn hours, the radiant will be almost overhead and very few meteors will be obscured by your horizon. Of course, all motion is relative, and the debris has some motion of its own, but it’s primarily the Earth’s orbital speed of 30 km/s (18 miles/sec) that provides the energy for all the fireworks. In the case of the Lyrids, their own 18 km/s velocity relative to Earth’s orbit means the average impact speed will be 48 km/s. Compared to other meteor swarms, that’s “fast.” So any Lyrids you see are likely to be of short duration.